American families have been bonded together through their faith since this great nation was founded. 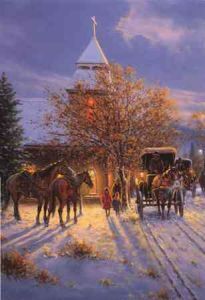 Families and friends have gathered on this cold evening in the early 1900's to fellowship and worship. It was a simpler time when families were strong and values were not compromised. It is a pleasant thing - Remembering Sunday.